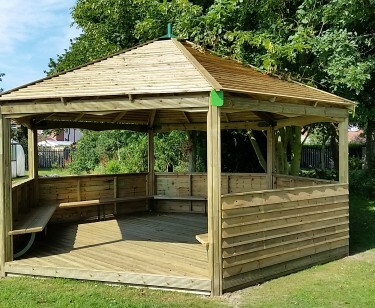 Our Timber Outdoor Classrooms provide an opportunity for every child to enjoy the learning process in a naturally outdoor friendly environment. These are available in three sizes, 3m, 4m and 5m and utilize the 125 x 125mm Safalog laminated post. They can accommodate up to 30 children and are available with or without seating and sides.